The University of Bern is part of the international "Blue Community" initiative that campaigns to recognize water as a human right and a public commodity. As a "Blue University", it takes its water from the public supply – i.e. tap water – and avoids transported, commercially available bottled water as much as possible. 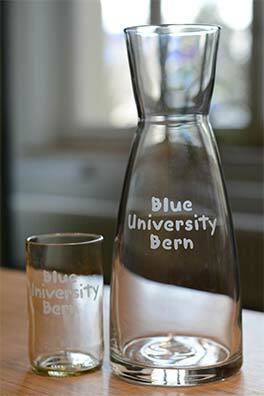 The university has produced water carafes bearing the "Blue University" logo in order to reinforce this message. Employees are encouraged to fill these carafes with tap water at their workplaces and during meetings. The carafes can be purchased at cost price.